Have you ever walked into someone’s home at Christmas time, only to be blinded by a barrage of red and green lights hung from floor to ceiling, singing snowmen on the mantel, and tiny stuffed Santa figures perched on every available surface? We all know those people, who just don’t seem to know when enough is enough. But sometimes, it’s hard to know where that line is. One too many inflatable reindeer and your home will feel like a display in the Christmas section at Target. But not enough festivity, and you risk falling into Scrooge territory! Figuring out how to tastefully decorate your home for Christmas can be difficult, but I have a couple go-to tricks for incorporating the Christmas spirit into my home décor, without letting it overwhelm the room. Psst, I’ve got a secret for you, are you ready for this? …Your Christmas decorations don’t HAVE to be red and green! Just because that’s the traditional color palette, doesn’t you have to follow it. In fact, something a little more off the beaten path can make a bold statement. And especially if red and green would clash with the décor already in your living room, don’t feel like you have to force that particular aspect of Christmas cheer. Instead, opt for décor in neutrals, metallics, and other muted colors, which are absolutely “in” right now—and silver and gold are both festive and go with almost everything! So, before you go all out on green tinsel and red plaid ribbons, look at what’s already in your space, and consider what colors would complement those shades. Everything you use doesn’t have to look like it came directly from a department store. 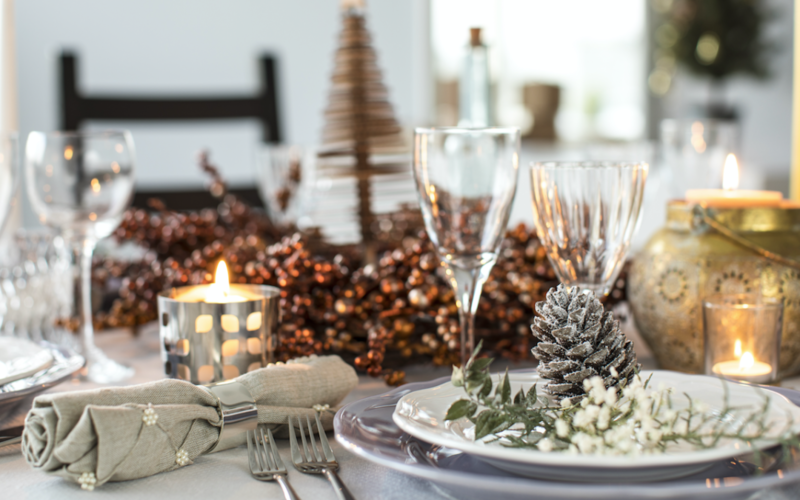 Whether you opt for custom beadwork, a hand-stitched pillow off Etsy, or a vintage table runner, these personalized details can add a layer of dimension to your home… and avoid that flat store-bought holiday feeling. If you’re feeling up to it, or maybe want to rope your family members into some craft projects, DIY Christmas decorations can also be a fun way to add a personal touch to your festive décor. As much as I love the Christmas season—and look forward to putting up the tree as soon as possible after Thanksgiving every single year—it’s important to choose your decorations carefully. Here, less is more, and an overwhelming amount of shiny lights, reindeer, and snowmen will only overwhelm a room. Instead of displaying all the Christmas décor you’ve ever picked up on clearance in January or inherited from your mom, pick two or three areas per room to decorate. Maybe the tree, the mantel, and the coffee table for the living room—and that’s it. That way, those areas will stand out even more, and your guests won’t feel lost in a wilderness of lights and tinsel. If you need a little guidance on how to freshen up your home, I’m here to help! I can help with all your furniture and décor needs, so that your home will be warm and welcoming this Christmas season. Contact me today to schedule a consultation!